6 Simple Ways to Avoid the Google Penalty Cliff in 2016 - More Traffic. More Leads. More Business. 1. Create high quality content. Your visitors are looking for specific information. If you’re answering a question, give detailed answers that cover the topic as completely as possible. Your goal with your content is to engage your visitors so they become clients or customers. Google’s goal is to provide the answer to each specific search query so that your visitors continue to use Google for searches. 2. Keep your keywords relevant and on the topic of your “focus keyword”. Several years ago you could write content that was “stuffed” with keywords. Google’s algorithm wasn’t very good at “reading” full sentences but now it is. The problem I see a lot is that the right keywords are not present in content. Your content needs to include variations of the “focus keyword” to give Google a good idea of what your page is about. But keep in mind, don’t overdo the keywords. Your content should sound natural for your readers. You can check out the value of your page by looking at the metrics for that page in Google Analytics. Monitor your important pages in Google Analytics and keep adjusting the content until you get good values in these four metrics. Backlinks are the most important offsite optimization you can do for organic SEO. Backlinks are also the biggest cause of serious Google Penalties. Don’t spam blog comments, forums, or directories. Don’t exchange, trade or buy links. Stick with the Google guidelines or risk a serious penalty. 4. Avoid all low quality directories. Directory submissions are great for traffic and for building your backlink profile. Local search directories, industry specific directories, and general business directories can really help your business by driving qualified traffic and improving your local rankings. The directories that cause real problems are fairly easy to spot. 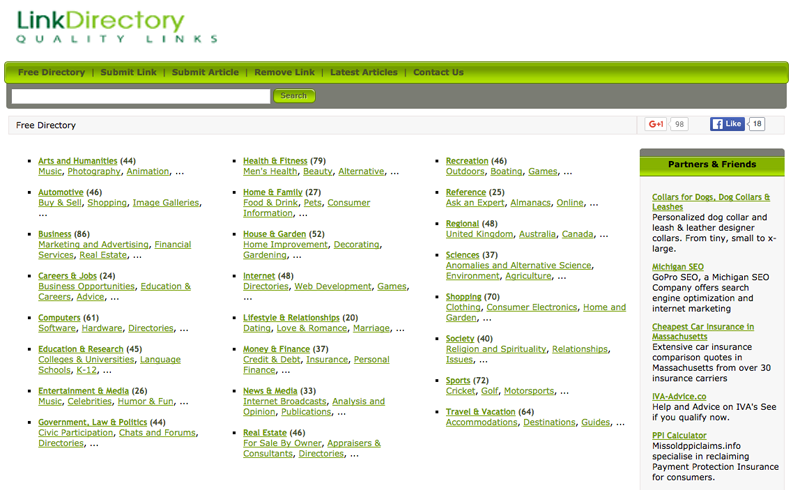 Here’s a very short list of some quality directories. 5. Guest blogging in relevant, good quality blogs only. Guest blogging is a great way to build your backlink profile and drive high quality traffic to your website. Where guest blogging can get you into trouble is when you do a guest blog for a low quality blog with lots of outgoing links. Google’s algorithm can detect spammy blogs and can hit you with a Google Penalty. 6. Duplicate content. Don’t Do It! Duplicate content is not just one or two repeats of the same 1,000 words on different sites. To trip a duplicate content penalty you have to have dozens or hundreds of duplicate content pages on a low quality site. You can certainly repost good content (add attribution – it’s always appreciated!). You won’t rank for that content but you’ll be providing your visitors with some information they will find useful or interesting. For example, you might repost one of your guest blogs on your own site. The Google Penalty Cliff is easy to avoid, but you have to know what to do. What is a Google Penalty and why should I care? A Google Penalty can cause a major loss of traffic that will be very difficult and very costly to restore. Google will penalize your site if you violate Google’s Webmaster Guidelines. Penalties can show up as a very visible drop in traffic across the board, or possibly as a big drop in traffic for a single keyword. If your website has dropped ten or more positions in the SERPs for all your pages, or disappeared completely, you’ve probably been hit by a Google Manual Penalty or a Google Algorithm Update Penalty. If your traffic looks like this, you have been hit by a penalty. How do I know if my website is already penalized? If you have a manual penalty, Google will send you a message via Google Search Console. If you’re not hooked up to Google Search Console, go here and get signed up. Manual penalties happen when Google’s Algorithm is triggered by some element of your website that Google considers to be against its “Terms of Service” or TOS (Google sends you a manual penalty message only if they manually review your site). A manual penalty will impact your site’s rankings fairly dramatically. This penalty may be against individual pages, or can apply to every page on your website. In extreme cases, your entire website will be removed from Google’s search results. Essentially, your site will be de-indexed. The only way to fix a manual penalty is to submit a Reconsideration Request to Google after a lot of cleanup and repair. This is very difficult and costly, and there is no guarantee that your site will be re-indexed. A Google Algorithm Penalty happens when Google updates its algorithms. Google Penguin and Panda are the two major algorithms that cause significant penalties. You can be hit by a Google Penguin Penalty if you have spammy backlinks, typically hundreds or even thousands. This is a very severe penalty and can be very hard to reverse. A Google Panda Penalty hits if your website consists of thin, low quality content or duplicate content. Google doesn’t send you a message in Google search console, but a severe drop in organic search traffic usually means you’ve been hit with a penalty. If you want to be sure, you can look at when your traffic had a sudden drop, and compare it with when Google published an algorithm update. Moz is a good resource for a list of all Google’s Algorithm updates. To really prevent any problems with reposting you can add a link to the original article with this bit of code. This tells Google where the original article is from and prevents any duplicate content issues. Losing Traffic? Got a Penalty? We Can Help!